For a long time, bromeliads were considered advanced or expert houseplants, more fit for a greenhouse than a normal home, but bromeliads are finally beginning to attract the attention they deserve. The truth is, that bromeliads can be easily adapted to regular home conditions. This is good news for the houseplant enthusiast because bromeliads are available in an astonishing array of colors and textures. Even discounting their showy flower displays, bromeliads are beautiful foliage plants, with strappy leaves in red, green, purple, orange, yellow, banded, stripes, spots or other combinations. There are actually several subfamilies of bromeliads. Pineapples and Spanish moss are both kinds of bromeliads. But the ones most often seen in cultivation are epiphytic plants that grow naturally in the tropical or subtropical regions of the Americas. As a general rule of thumb, bromeliads will thrive in the same conditions as epiphytic orchids. However, they are considerably more tolerant than orchids of fluctuations in temperature, drought, and careless feeding. The most common bromeliads (such as the Aechmea, Neoregelia, and Guzmania genus) grow in rosettes of relatively large, strappy leaves around a central cup. These leaves are often relatively thick and may have backward facing spines that are capable of giving you a sharp jab. The leaves arise from the center cup, which is designed to hold water. In nature, bromeliads' roots are adapted to clinging onto trees. The plant relies on rainfall and leaf litter to fill up the central cup with both water and ample organic material for food. Obviously, few people have a tropical rainforest in their homes, and this is where bromeliads really shine. The plants are highly adaptable, and for most people, it's actually better to grow them in a rich, fast-draining potting soil than it is to attempt to duplicate their native conditions. Plants grown in pots will quickly adapt. Their roots and leaves will absorb nutrients and water, and it won't be necessary to fill the central cup at all. In fact, if it's going to be cold or especially dark, it may be dangerous to keep the cup filled because it will encourage bacterial or fungal growth. Fortunately, bromeliads are beautiful foliage plants. No attempt is made to bloom them. In general, bromeliads need a fairly specific set of conditions to bloom—and these conditions vary from genus to genus. Their bloom cycle is affected by day length, temperature, humidity, water, and feeding. While it can be difficult to accurately replicate the conditions any particular bromeliad needs to bloom, some research has shown that the plants can be forced to bloom by exposure to ethylene gas. If you want to force your plant to spike, place it in a tightly closed, clear plastic bag for up to 10 days with a ripe apple. The apple will give off ethylene gas as it decomposes. Make sure any water is drained from the bromeliad's central cup before attempting this. Light: Different genera of bromeliads are tolerant of different levels of light. Some can withstand full tropical sun, while others will quickly scorch. In general, however, the plants prefer well-lit, bright windowsills, but not direct sunlight. A south, west, or east window is often perfect. Plants that are yellowish may be receiving too much light, while plants that are dark green or elongated may be receiving too little light. 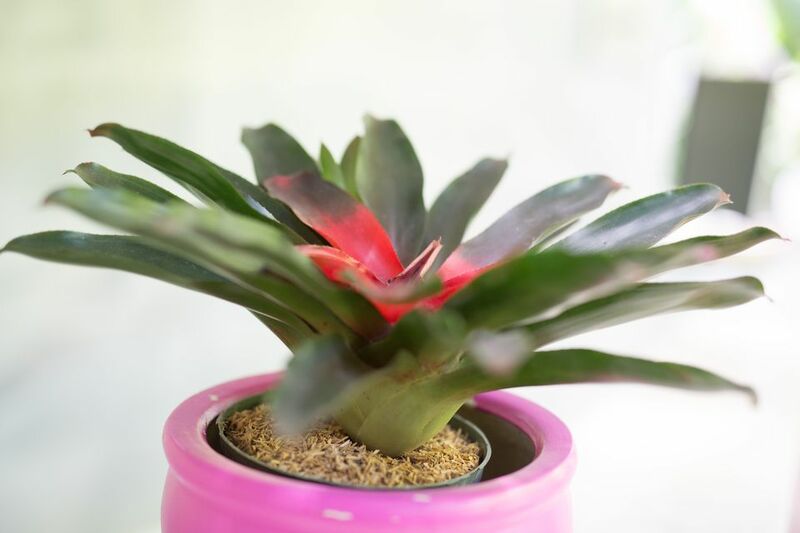 Temperature: Bromeliads are also highly tolerant of temperature variations, but remember that plants in hotter conditions will need more humidity. Ideally, bromeliads prefer temperatures between 55ºF and 80ºF. They should not be exposed to temperatures under 40ºF. Water: Bromeliads are very tolerant of drought conditions. In a normal house, it's not necessary to keep the central cup filled with water, but this is an option if the light levels, temperature, and humidity are high enough. If you do centrally water your bromeliad, make sure to flush the central cup every so often to remove any built-up salts. In general, however, it's enough to water these plants through the soil weekly during the growing season and reduce watering during the winter rest period. Never let the plant rest in standing water. Potting Soil: Although they are epiphytic, bromeliads can be grown in fast-draining potting soil. A mixture of 2/3 peat-based soil mix and 1/3 sand is a good idea. Bromeliads can also be grown mounted to boards and logs. These plants will need to be watered more often and consistently throughout the year. Fertilizer: Bromeliads are not heavy feeders. During the growing season, use a liquid fertilizer at 1/2 or 1/4 strength. If you use a slow-release pellet fertilizer and water the central cup, a single pellet dropped into the cup will suffice for a season. Slow-release pellets can also be mixed into the soil compost. Bromeliads multiply by sending up offsets, or pups. In a natural growth cycle, a mature plant will send up a flower spike that includes small, sometimes insignificant flowers, surrounded by showy bracts (it's really the bracts that people like in bromeliad flowers). The flower bracts are often long-lasting—sometimes for months. After the flower dies, the plant begins to die also, and over the next few months, will decline. However, the mother plant will send out one or several smaller pups at the base of the plant. These pups can be carefully cut off with sterile snippers and potted up individually. Pups should only be potted up after they develop a few roots and begin to form the central cup characteristic to bromeliads.